Things didn't start well. I arrived late at the Coburg Athletics track and by the time I registered and put my race number 26 on, the starting gun had fired. I literally had to run out of the club house and onto the track to catch the field! My arch nemesis, the Sun was out and it was a warm and humid morning. Pretty much the sort of of conditions I struggle with the most. For the first 4km I stayed consistently under 4:20 k's and then I reached the bottom of the hill in Coburg Lake Park and got done by the short steep ascent. I basically cracked under the heat and humidity and had to take a walking break halfway up the hill, not long after that photo was taken of me. This was the first time ever I had cracked within the first 5km of a race! From then on it just became a battle to the finish line. I slipped from 6th in the race to my finishing place of 8th as runners who had run the smarter and more consistent pace passed me. The final few hundred metres were run on the athletics track where the race had started. Not quite the same as running a lap inside the MCG but pretty cool nonetheless. I crossed the line in a disappointing time of 45:44. Slower than last year, making it the first time I had failed to improve on a previous year's time at an event. I guess that was bound to happen eventually but after the high from my City2Sea run, I didn't see it coming so soon. I hung around for the trophy presentations with the top 3 male and females in each category getting a trophy. It was a talented field in the male 10km with the top 4 all cracking 40 minutes. The winner finished in 37:25! Afterwards complimentary massages and biscuits awaited everyone in the club house. Another well run event by the club and special thanks to all the course volunteers who make it possible. 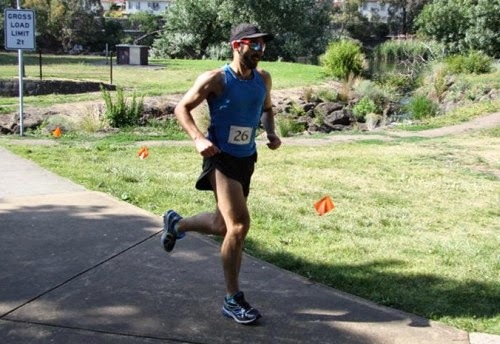 Thinking of running the 12km Coburg Harriers New Years Resolution Fun Run next on January 18th. Until then train hard and run strong! Sounds like a nice little "fun run" - I had it penciled into my diary, but was feeling a bit tired after the City2Sea and so didn't go. Will definitely add their 10k & 15k runs to my diary for next year - 12k is just a bit too weird sounding for me!